I first read Shanta by Marie Thøger (Harmondsworth: Penguin Books, 1961) in about 1970. There was magic for me in that book. Shanta, the protagonist, was only a few years older than me. It made me feel that someone, somewhere, had thought that India, and little Indian girls like me were important enough to write about when everyone around me seemed to think we were strange, smelly little creatures with oiled hair in pigtails who were expected not to speak English at all, never mind well. For years, a copy of Shanta sat on my bookcase. I was scared to read it again, afraid that the book I had read as a young girl in junior school would disappoint me as an adult. Encouraged by Leila Rasheed to re-read it, I decided to see how the story had changed for me with age and experience. My heart lurched halfway down the first page at the reference to a brown girl sitting in red dirt threading flowers onto a straw. But I read on, and was rewarded with a coming of age story about a young girl coming to terms with changes around her: old ways of living changed by modern thought and modern methods; and learning adult ways to prepare for marriage. Shanta faces tragedy and learns how to cope when life takes unforeseen paths. There are some beautiful descriptions nestled in the pages: electric light helps to make the night shorter; the theories of how the mountains near the maharaja’s town came to be; the safety of Shanta’s village compared with the strangeness of the town and its people; the sharp contrast of caste status between town and village; and how the world becomes different when a child’s perspective begins to shift towards adulthood. There were other things which did not sit so well: references to ‘dark’ people; the bus loaded with people inside and outside, a new sight but described as ‘typically Indian’; the drinking of milk straight from a coconut when it should be water because coconut milk does not occur naturally in the shell; girls are taught to obey and please their husbands; Shanta has no choice in the marriage which is arranged for her and seems to have no say in what happens in her life. Even the blurb written by the Editor of Puffin Books, which I read last in case it contained plot spoilers, begins with generalisations which hint at all Indian children having to go hungry, carry water and do field work from an early age. While this may be true for some, it does not apply to everyone. 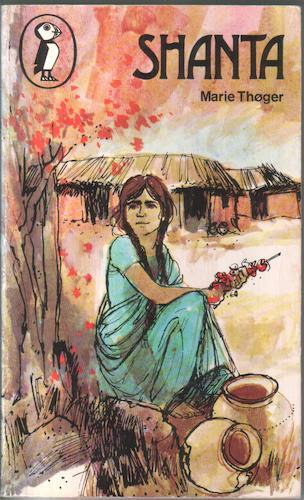 But the thing that made me feel most proud of having loved this book, and pleased to have read again, was that the young, naïve Shanta at the beginning of the book who had no control over her life, had grown to become a role model not just for other little girls but women too. Leila: The language you use in the review is so emotive – ‘proud’, ‘heart lurching.’ I absolutely know what you mean, I’ve felt that heart lurch feeling too, (unfortunately most recently when reading Rider Haggard and Jules Verne and coming across certain racist passages that stopped me reading any further). Do you think there’s a sense in which we don’t want to be let down by the books we loved as a child? Almost as if they were people –role models, in a way? Is that a feeling you recognise? Raj: There’s definitely a sense of not wanting to be let down when revisiting old stories. That’s why it took me over forty years to re-read Shanta – and then only thanks to that final shove you gave me by encouraging me! It took me years to track down a copy of the book, and then I had years of picking it up to read but the sense of fear was so strong I’d put the book back on the shelf without even opening it. I thought the little girl who had inspired me was better as a figment of my imagination; too many years had passed for it to be regarded as a true memory. I didn’t want to lose that sense of ‘belonging’. I didn’t want to feel disappointed by discovering that Shanta was anything other than the role model I had clung to for most of my life. Shanta had made me feel important, because a little Indian girl was important enough to be the main character in a book. I had only been living in England about two years when I read Shanta for the first time. I suppose there was also an element of familiarity because the book was set in India, the country of my birth, even though the India I had left behind was nothing like Shanta’s world: I grew up in the busiest bazaar in a town in the Punjab and attended an English Medium School (which means it taught in English). I came to England at a time when racism towards immigrants was overt. The white children at the junior school I attended would not think twice about pointing out our ‘otherness’: our colour, our smell, the way we wore our hair or whatever the taunt of each particular day happened to be. I could relate to Shanta simply because she was Indian. I felt that I didn’t need to explain myself to her. She would understand me because she was like me. Leila: I said that I don’t hear people talking about the impact that finding ‘someone like me’ in a book has had on them, but maybe it’s because I’m not listening hard enough or am not in the right conversations! Is this something you speak to people about? Raj: I don’t think it’s a question of not listening hard enough. I think there are many issues to consider here. Shanta was the only Asian character I came across until probably Meera Syal’s Meena in Anita and Me, and you said Mowgli was the only Asian character you’d found in a book. That doesn’t give non-‘white’ children many characters to relate to since the 1960s, does it? That’s probably why people are still not having conversations about the impact of finding ‘someone like me’. It’s because they can’t. Perhaps people my age, who have older children, are in a reading void because there are not yet any grandchildren to read to. Sadly, with the findings of the Walter Dean Myers article, it seems that unless things change soon, there won’t be any characters my own grandchildren might be able to identify with. Also, I think maybe people are either not finding time to read, or are not reading a broad spectrum of books. I read books intended for any age, child or adult, and I don’t mind reading lots of different genres. Perhaps other readers are not doing the same and therefore don’t know which characters they might relate to are out there waiting to be discovered. I’ll also confess to having issues after reading certain books recently. Despite being published by major publishing houses, the writing quality has been poor, or the story has been weak. As a writer, I’ve persevered with reading them to the end in order to learn how to avoid making similar mistakes. If I were reading them as a non-writer, I doubt I would have read them beyond the first few pages, or perhaps the first chapter or two. I certainly would not have wanted to read them to my children, despite them being set in India and containing Indian characters. If we’re to have books which contain characters which non-white (or maybe non-white English) children can relate to, they need to be of good quality. Otherwise, it is an insult to us and our children to provide books for the sake of books rather than to provide good role models which children can relate to and which help to make them feel included, not excluded, in the world they inhabit. I’d like to see non-white characters to look up to as I looked up to Scout, Jem or Boo Radley in To Kill A Mockingbird by Harper Lee. I don’t want my children or grandchildren to grow up thinking there are no characters who are ‘like them’. Leila: As a mother, did you feel, as your children were growing up, that you could find children’s books that reflected them in the way you felt Shanta reflected you? If so, which titles were they? And if not, did that matter to you – and do you think it mattered to your children, do you think it had an impact? Raj: First of all, as an older sister I encouraged my younger siblings to read ‘non-standard’ type books. I would hunt out bookswhich had non-white characters in them and would find books set in China, Africa, Asia, Australia – any place where the protagonists were not those like Peter and Jane and which did not feature the occasional golliwog or black doll as the token source of colour. I encouraged them to question what was wrong in the books (and films/TV programmes) where the only non-white characters were depicted as the bad guys or people who did not matter. I would also find books where the protagonist was a little different for other reasons, for example under-dogs such as the ugly duckling; any person, robot, animal facing adversity and prejudice or some form of oppression. I did the same with my own children. Sadly, I can’t remember the titles or authors of many of the books I found. I do know there were lots of fairy tales where the girls, children or animals were strong, positive role models. They did things for themselves and didn’t hang around waiting for Princes, grownups or humans to rescue them. There were Arabian Nights stories, and folktales from around the world, and some of the stories I had heard from family members when I was a child. I remember buying a lot of Barefoot Books: tales about mothers and daughters, fathers and sons, how the week was made. 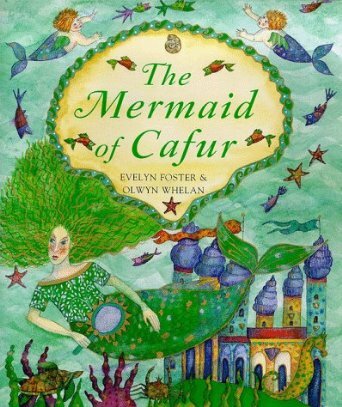 For my daughter, there were lots of books about mermaids. I list some books or stories below which my children remembered reading and enjoying. I think one can assume that this also means that there was a lack of role models or people to identify with in the ‘mainstream’ books which were available when my siblings were growing up, and even when my own children were young, but there were alternatives which could be found if you searched hard enough. I think this is part of the reason why I loved Barefoot Books for my children. The beautifully illustrated story books respected cultural diversity and told stories from around the world. Thank you so much to Raj for guesting. If you would like to write and/or be interviewed about ‘finding someone like me’ in books (you don’t have to be from an ethnic minority, or a writer) I’d love to hear from you, or would be happy to link to a piece on your own blog.